Fatmawati, Fatmawati (2005) Hubungan antara kebutuhan akan persahabatan dengan komptensi interpersonal pada remaja awal. Skripsi thesis, universitas Tarumanagara. Early adolescence experiences many important changes, including physical, cognitive, and social and emotional changes. Adolescence going through rapid changes take comfort from being with others who are going through similar changes. The intensity of friendship is greater in adolescence than at any other time in the life span. The importance of peer roles increases the need of afnliation in early adolescence. Need of affiliation must be supported by interpersonal competences. Early adolescent who have more interpersonal competences than others will be more respected to join in friendship relations. 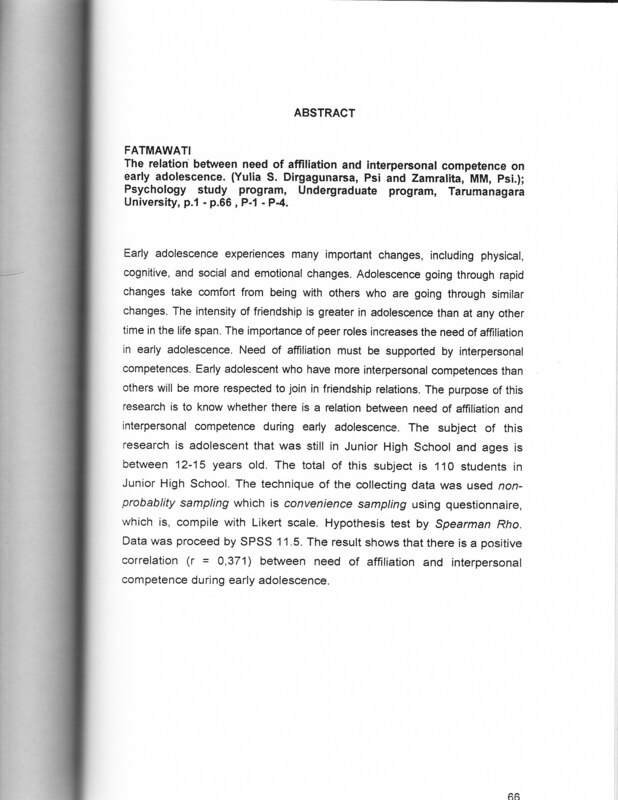 The purpose of this research is to know whether there is a relation between need of affiliation and interpersonal competence during early adolescence. The subject of this research is adolescent that was still in Junior High School and ages is between 12-15 years old. The total of this subject is 110 students in Junior High School. The technique of the collecting data was used non- probablity sampling which is convenience sampling using questionnaire, which is, compile with Likert scale. Hypothesis test by Spearman Rho. Data was proceed by SPSS 11.5. The result shows that there is a positive correlation (r = 0,371) between need of affiliation and interpersonal competence during early adolescence.